The media was flat-footed, as usual, in the face of this sudden development. TV anchors brought on their usual “experts” dripping tropes about how India couldn’t be trusted because it was secretly plotting the downfall of nuclear Pakistan in cahoots with America and Israel — one asserted that the American embassy in Islamabad always had an Israeli agent on its staff — and that Pakistan should talk only about Kashmir to Modi. Nobody apologised for having earlier fired bruising broadsides at Sharif for going to Modi’s investiture and appearing “slavish” while shaking hands with him. Clearly, the media was exploiting the presumed gulf between Sharif and the army. Shockingly, an “expert” actually accused Modi of doing just that. Imran Khan chose to object to the presence at Jati Umra of an Indian tycoon with mining interests in Afghanistan, warning the nation of the imminent financial hanky-panky between the two PMs. But the former Pakistan high commissioner to New Delhi, Ashraf Qazi, broke with the frog chorus and welcomed the Jati Umra visit, saying Pakistan should hope to bring up Kashmir only if it is prepared to act against the cross-border “proxy warriors” it has used against India. Pakistan’s defence minister, Khawaja Asif, significantly flagged the need to act together against terrorism threatening South Asia from its bastion in Afghanistan, clearly pointing to a possible joint India-Pakistan Afghan strategy. Anyone outside South Asia — it will have to be outside, given our frozen postures — will agree that a joint Afghan policy is doable within the Saarc framework. Although Pakistan has knocked the bottom out of its old Afghan policy by attacking North Waziristan and removing Afghan and Pakistani terrorists from its territory, it still sees the battleground as a proxy against India. The fallout of this policy change inside Afghanistan: The Taliban that it is supposed to bring to the peace table no longer trusts it, and the next Taliban government, apart from not recognising the Durand Line, will squeeze Pakistan for treasure with kidnappings and heists. It will not be the old Taliban that, after coming to power in 1996, had made the Indian embassy in Kabul pack up and leave. It will be a new kind of Taliban likely controlled by the Islamic State, already active in Afghan provinces close to Pakistan and in Karachi. The Pashtun ruling Afghanistan from Kabul hate Pakistan; the non-Pashtun of northern Afghanistan hate Pakistan even more for Pakistan unleashing the Taliban on them in the past. The proxy war against India has not paid off and doesn’t wash with the people at home any longer, not even the fabrication about “dozens of Indian consulates” in Afghanistan. Pakistan must look to its real self-interest — the welfare of the Pakistani population — and get together with India and other neighbours, including Iran, to allow two gas pipelines from Iran and Turkmenistan to come to South Asia. Pakistan can no longer suffer the scenario of three neighbours — India, Afghanistan and Iran — subjecting it to mortar fire on any given day. Honour-based societies can’t swallow peace if it comes in the shape of “balanced dissatisfactions”. Therefore, any India-Pakistan process of negotiations will be long-drawn-out because “core issues” have become encrusted with lesser cases studiously built by bureaucracies specialising in deadlocks. Let these bureaucracies talk endlessly on Kashmir, Sir Creek, Siachen and Indus waters against the background chatter of raucous TV anchors and their “experts”. Agree on a joint policy of tackling Afghanistan and the terror that will radiate from it in the coming days. Both sides are keen to apply the economic relaxant of trade and trade routes that China is already funding in Pakistan for “regional” trade. 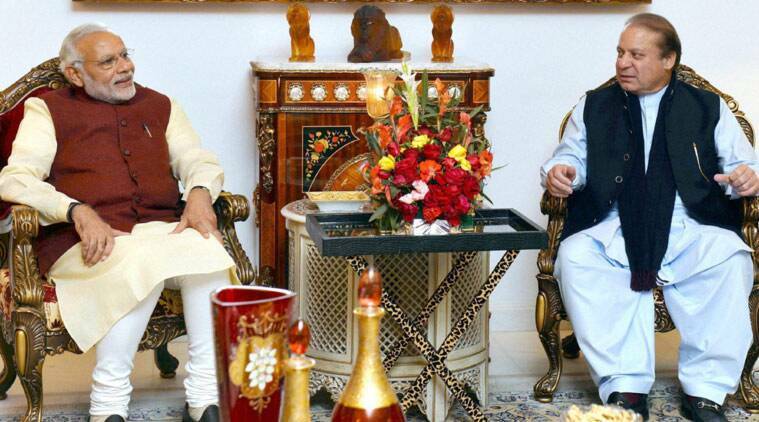 Modi and Sharif can be standing at a historic crossroads. They can’t afford a Taliban comeback in an Afghanistan looking over its shoulder at the Islamic State. They must strengthen the hands of the current government in Kabul before a “re-conquest” of Afghanistan by the Taliban gets underway, with millions of refugees pouring into a Pakistan. Pakistan has to avoid an India-Taliban military nutcracker situation on its borders; and India has to prevent the advance of the new Middle East terrorism into its population.